Card games can be traced back to around 1120 in China. The Chinese, it seems, invented paper. The Puritans felt that cards were the devil's work and frowned on trying to win at cards. English Queen Elizabeth the First recognized that her countrymen loved card games and began to tax decks of cards. The King of Spades is the fanciest of all the cards and the design of that card indicated the "stamp" of the paid tax. The French began placing the pictures of actual rulers, or past rulers, on the kings, queens and jacks. 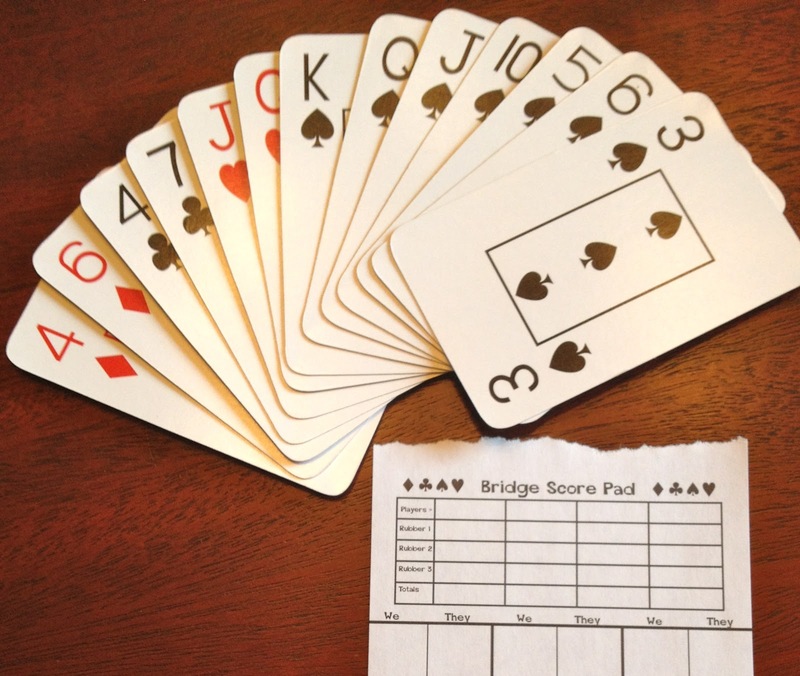 The game of Bridge was derived from the game of Whist, supposedly first played in Russia. 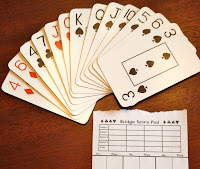 The English civil servants who were living in India began to play bridge as a way to pass time while in their "exile" from their mother country. The Italians got into the habit of playing cards as well and their playing cards were works of art. Lots of history lies in between, but modern Bridge was introduced to New York City around the 1890's. In 1925, Henry Vanderbilt was bored on a cruise ship and began to add wagers to bridge games. Many bridge clubs to this day play for money or for a prize at the end of the bridge "party." 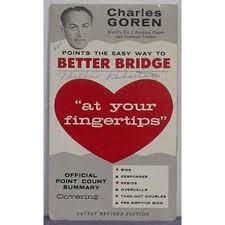 The years of graduate school were a perfect time to learn to play bridge. It was an inexpensive way to spend some leisure time. Our wagers were never over twenty five cents per person for the entire evening...hardly a gamble at all! Our teachers included the elderly aunt and uncle of a fellow grad student and some already learned fellow students. Dr. and Mrs. Brown hosted several lovely parties for the young folks they were mentoring. They loved the game and the delicious desserts that were served as we played. Mrs. Brown was a math instructor at LSU and was a terror in the classroom. As a hostess, she was the one of the kindest and most gracious women I have known. Dr. Brown was also a professor at LSU and his garden was filled with hybrid camellia bushes he had grafted them to beautiful results. Odd, how one remembers such details. We were lucky to have their niece, Jeannine, as a friend. I credit her with our introduction to our lifetime love of the game. 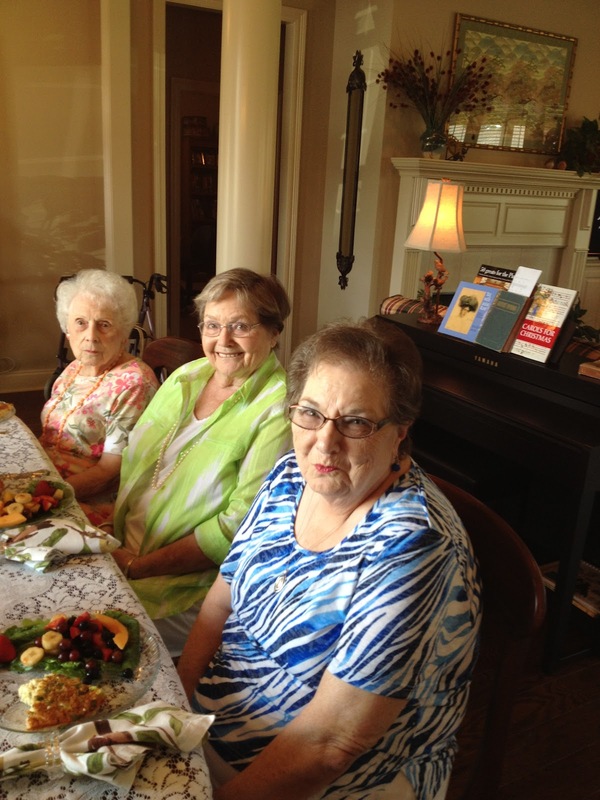 Through the years bridge became a favorite way to enjoy friendship and fellowship with like-minded people. There have been parties with entire meals, ones where popcorn and dessert were served and even all day sessions where each brought a sandwich and the play was not interrupted for eating. There have been couples groups where husband and wife were partners for the evening and duplicate games with friends known since those grad school days. It is a thinking game with rules that must be remembered. Charles Goren, a champion bridge player, wrote a book of rules and most players follow those rules. The bidding involves communicating with a partner to reveal several things. The bidding art tells one's partner how many points are between the two, what suits are best, if there is a chance of taking "tricks" and how many can be taken. An error in bidding can be fatal to the play of the cards. I have played bridge for over 40 years and I still make those errors. Learning the intricacies of bidding is an ongoing process. Playing bridge is like riding a bicycle. Once learned, it is not forgotten. People of all ages and backgrounds can sit down to bridge and use the universal language of bidding to play the game. It is a game of etiquette. One must remember to "thank his partner" when the "dummy" hand is laid down on the table, even if it is horrific! One must remain silent during the "play" so as not to interrupt concentration. "Talking across the table" is also a no-no! There is even a special way to place the shuffled deck on the table so as to keep up with the identity of the next dealer. However, one expert player told me once, that "one peek is worth two finesses" if someone is holding his/her hand in an indiscreet way. The biggest rule is: "A card laid is a card played." Once the card goes on the table, it cannot be removed. Serious bridge players want to win the quarters that have been wagered! After a recent downsizing and moving to a small community, bridge became a vehicle of meeting people and forming new friendships. Bridge players are always seeking other bridge players. I was able to find a group of women who shared my love for the game and who included me in their groups that have been established for decades. It must be understood that retirement has become a time of enjoying hobbies, bridge playing included. Last week a bridge party and lunch was hosted at our house. The invitees were residents and a local retirement community with whom I enjoy a monthly game and some other friends met through the game. One guest is 92 years old and is still an excellent player. Summer in Louisiana is very hot, so it made sense to have a "party" inside for several hours on a July afternoon. Invitations were sent and two tables of bridge players (8 ladies) assembled for food and cards. Choosing to make it elegant with a prettily set table made it extra special for those who took time to attend. My husband, always a good sport, chaufferred those who no longer drive. 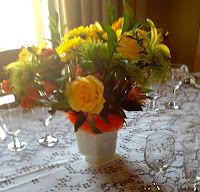 A festive mood was set with a bouquet of fresh flowers from a local supermarket. 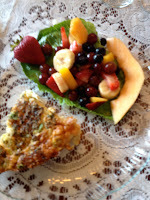 The menu included seafood quiche, summer fruit salad, tea biscuits, fig preserves (for the biscuits), peach tea and Lemon Ice Box pie. Coffee provided a lift during the bridge game that followed the meal. My Mom's fancy coffee cups made an appearance and the table was set with my "good stuff." The quiche was a hit! It was actually an "Impossible Pie" from a Bisquick recipe of many years ago. That recipe has become a "go to" for lunches served at my table as it can be assembled in part the night before and baked just before serving. It calls for shrimp, but the addition of crab meat is delicious. The fruit salad can be prepared early if the juice of a lemon is stirred into the bowl to prevent the fruit from turning brown. Dessert and coffee are served during the bridge playing, so it must be kept simple for the hostess. A no-bake pie was selected. Even though she can't remember giving me the recipe, I credit a former colleague and friend, Claudia Fowler, for the pie variation I created. 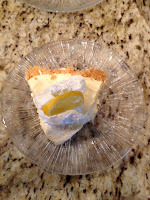 Her original recipe was Key Lime, but I changed it to lemon. Since we weren't wagering money, a prize was awarded to the person with the most points at the end of the afternoon. It was a one-of-a-kind necklace purchased from my friend, Pam Pennington Firmin. Pam's jewelry making hobby produces designs are always a hit and the winner was delighted. Menu items recipes are below. 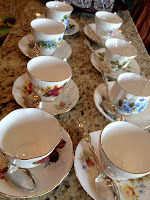 You don't have to have a Bridge Party to serve them, as all are crowd pleasers. Enjoy and if you don't know how to play bridge, you should learn. It's a great way to spend some quality time with friends, old and new. -Place milk, eggs, Bisquick and seasonings in blender and blend for 20 seconds. -Immediately pour milk mixture into pie plate and bake for 30 to 35 minutes or until knife inserted in center comes out clean. -Cool for about 5 minutes before cutting into 6 servings. Olive is normally my sous chef, but she doesn't play bridge yet, so she decided to go home. I caught her as she was leaving our backyard to go to her house. 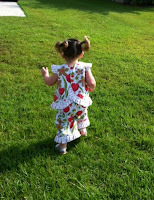 I think she looks cute in the outfit I sewed for her. 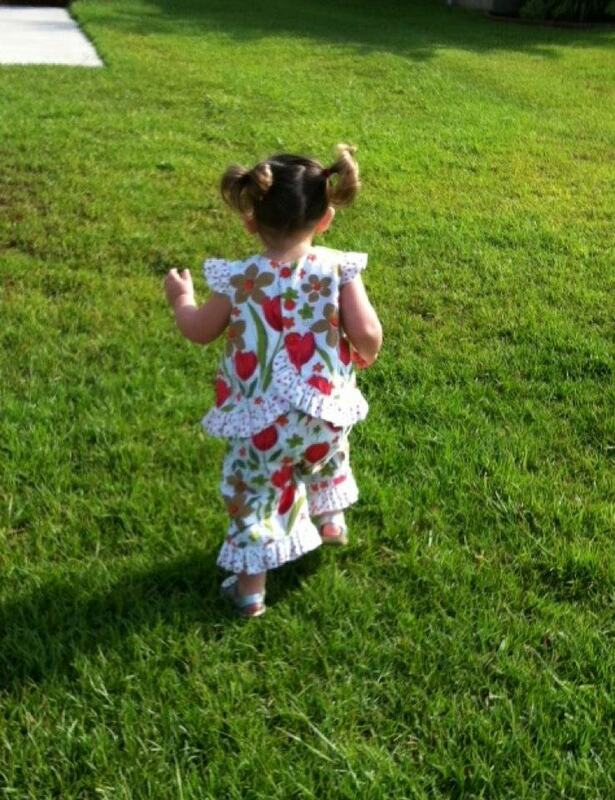 It's hard to believe she will be two years old in August! How time flies.